I have a 17-year old 21-ft expandable trailer that has held up pretty well especially since I store it indoors during the winter. However just before storing it last year, I noticed that there had been a leak in the front storage area. Apparently the outside seam had come loose and water had seeped inside. The floor cross member at the front had partially rotted and some of the 1/4" plywood under the floor tile. In the meantime, i made sure that the seam was caulked since the screw will no longer hold it to the chassis. The leak was only on one side and so only about 1/4 of the cross-member and floor is affected. Other than removing the benches and ripping out the affected cross-member and replacing it, any advice on repairing that part of the floor? I was thinking of just putting a new piece of 1/4" plywood over the affected area and then re-tiling. Your doing good for a 17 year old trailer. I wouldn't go crazy and start ripping out any sub-structure. Biggest thing is to STOP where it was leaking in the first place. You can spent 100 man hours doing a complete floor replacement but a 17 year old unit is only worth so much. A 1/4" plywood over-lay would do the job. I would screw it in just in case in the future it ever had to come out again. The front of any RV trailer takes a beating especially driving in the rain. On the roof I will do a hands and knees inspection 3 times a year of all caulked areas. Even my new trailer I check in my front storage area to make sure no water made it in if I drove thru a hard rain storm. I spent the weekend looking after a leak in the roof. It looks like the AC gasket was shot and there was some rippling on the ceiling inside. I replaced the gasket and also replaced a couple of broken vents while i was up there. I doubled up on all lap sealant on the roof just in case. I will probably just lay down a 1/4" sheet in the front storage area where the water had leaked in. The floor still looks strong enough and is all dried out now. I want to replace the linoleum there and the rest of the floor w/o taking all the benches out. I've tested some paste-and-stick 12" x 12" tiles but they don't adhere all that well onto the surface under the current linoleum. Any suggestions on what type of adhesive I could use to make sure they stay down? I also have the same issue! 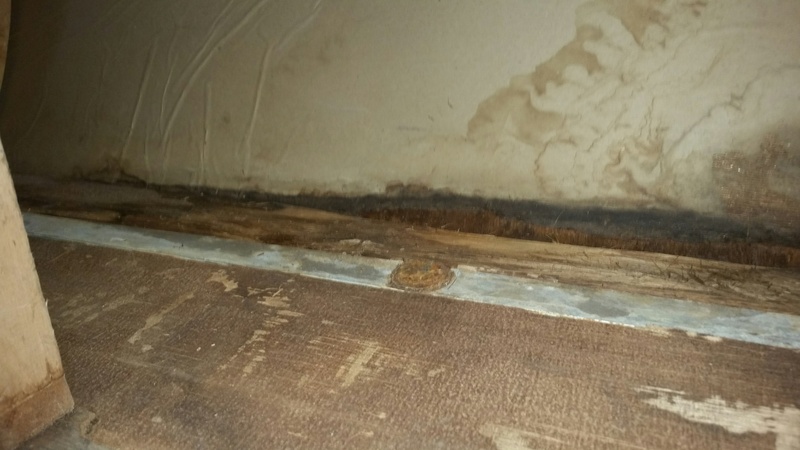 Seems that this 2003 B17B camper has water ingress in the same spots! My damage is quite extensive from what I am seeing pop outs were left open for quit some time. (another design flaw(canvas water pockets)) Previous attempt(s) have sheet rock screws holding front bottom molding in place. Inside cross piece along with flooring back to kitchen area is rotted. Previous owner tried to coverup with 1/2 ply and tile lino. Great winter project, too bad I have no garage!!! Brrrrr in NEPA! Front End Floor repair for this season. Update! Tore apart the front end removing all SR screws and 3" inside screws. 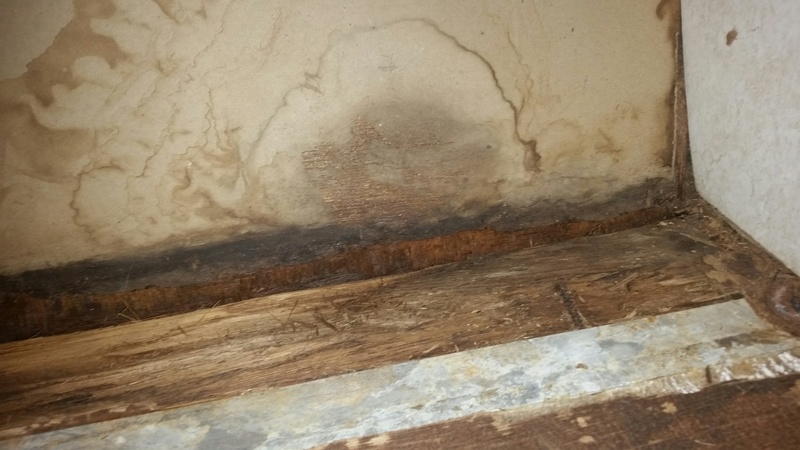 Once the rotted 2x4 tie was removed you could see why there was a leak! 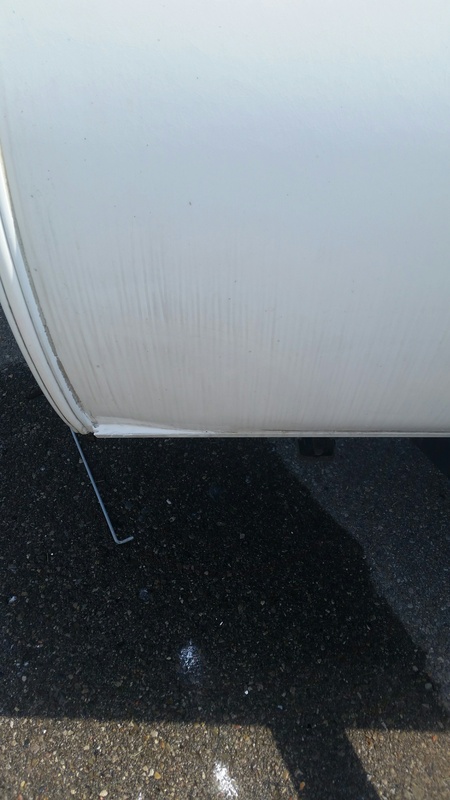 Who ever "repaired" the camper missed the mark sealing the front. There was a piece of material that was stuffed under the fascia trim and it was 3" too narrow to do any good. Also you could see daylight coming from the front corners. I now also found that the door side since there never was any cross bracing has sagged 3/8 to 1/2"! Next update a plan to remedy. Same problem with my C19 Trail Lite. I live in Dallas, PA. Are you nearby? My apologies I never received a notification that there was a reply! I am located near Hawley PA. I managed to put in a center beam in line with frame to remove any bounce, built 2 "L" brackets to perhaps bolster up door side. Hoping for no adverse effect to the outer shell and rood! It was supposed to be a good day today but as you well know in NEPA "Rain is it"